The Auto App Killer tweak that landed in the Cydia store yesterday is one that is causing mixed opinions around the jailbreak community, with most chatter surrounding whether or not a package of this nature is even required. The tweak is designed to allow jailbroken users some additional control over running processes on their device in the hope that it will keep either the iPhone or iPod touch running smoothly with no low memory warnings. Once installed, Auto App Killer allows users to set a certain low memory threshold, which is the minimum amount of free RAM they want their device to be running with before the system starts to terminate running apps in order to free up some of that precious memory resource. I am pretty sure the debate will run on and on about whether or not something like this is actually required, considering that iOS itself does a pretty good job of automatically handling memory on the device. But with that argument aside, the Auto App Killer tweak does a pretty good job when going about its business. Whenever an application is running and then closed by the user by pressing the Home button on the device, that app is sent to the background and finds itself at home in the multitasking tray. The theory behind this is that it can be quickly invoked again from memory should the user require it. The only way to remove that app totally from memory is to access the switcher bar, put the icons into edit (wiggle) mode and delete it from the background. Auto App Killer will essentially handle that process for you by killing apps that are taking memory. One of the good things about the tweak is that it actually respects applications that are currently in the background but are still running processes. So apps like Pandora or the Music app that may not be on screen, but are still streaming music will be left alive. Additionally, applications that are tracking GPS positions or running any other specific background process will not be killed, making it quite an efficient memory handling utility. On a personal level, I have never experienced any memory issues on any of my iOS devices, which to me suggests that Apple’s mobile OS does a bang-up job of handling this, and for additional support I use a tweak like WeeBackground Pro to kill running applications and free up memory. 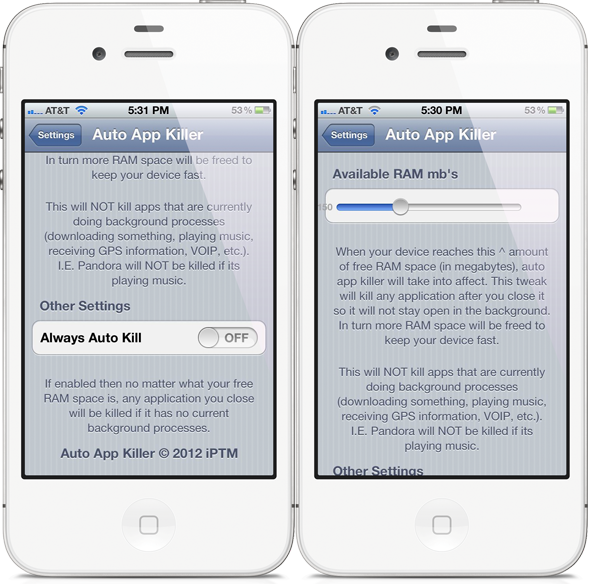 Auto App Killer is available for $1.49 from the BigBoss repository and requires a jailbroken iPhone or iPod touch running iOS 5 or above. This tweak is not compatible with the iPad.